Spend $100 or more and get a Free Travel Lotion Set! Spend $100 or more and receive a free Travel Lotion set featuring our five signature scents, Coconut, Lavender, Pikake, Plumeria and Ylang Ylang (2 oz. each). All qualifying orders, can enter the code: FREEWEHIWA at the checkout. All of our soaps are made with plant based oils, using organic oils whenever they are available. Olive oil serves as our primary foundation oil and is one of the best natural moisturizing oil. The combination of coconut oil and responsibly sourced palm oil helps to create a lush lather and a longer lasting bar. 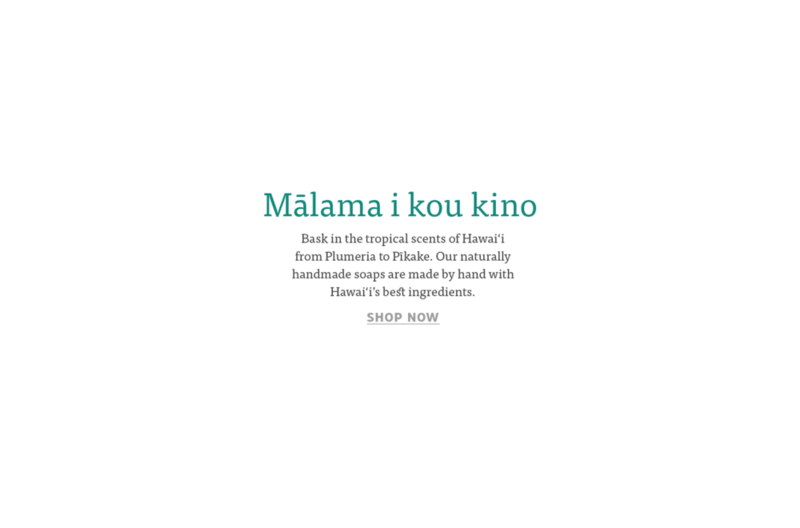 Many of our soaps are enhanced with Kukui Nut oil that has long since been used by Native Hawaiians for its therapeutic and healing properties. For many centuries, Hawaiians have harnessed the moisturizing benefits of the oil to heal and soothe skin. The oil is produced by pressing the kukui nut (candlenut) which contains essential fatty acids, vitamins and antioxidants and antimicrobial properties to heal skin exposed to harsh everyday elements including sun, wind and salt water.